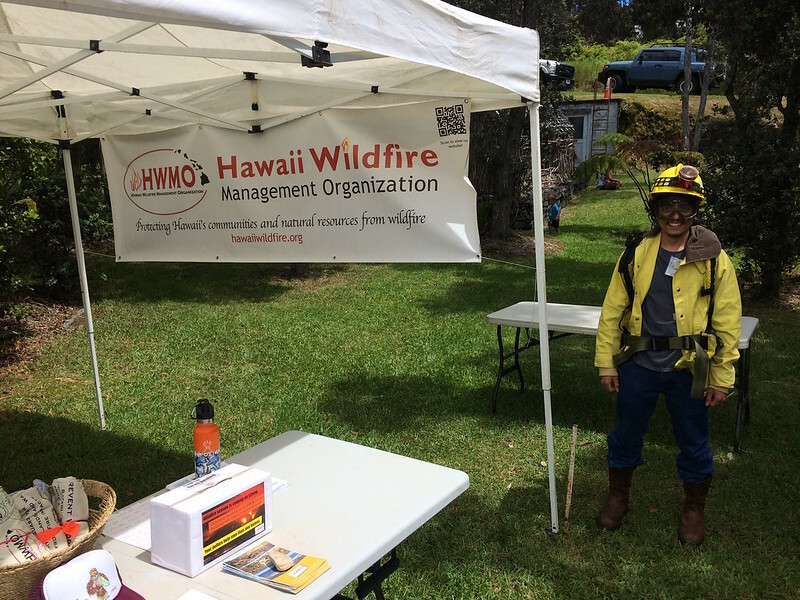 For the second year in a row, HWMO traveled to Volcano National Park to set-up an outreach booth for the BioBlitz Cultural Festival on August 27th. The weather could not have been any better with a beautiful sunny morning with light mist in the afternoon. While groups of keiki joined scientists in the field to inventory native species in the park, visitors from all over the islands and the world listened to great live music, watched beautiful and powerful hula performances, and stopped by the many different outreach and cultural tents on the Visitor Center lawn. Pablo Beimler presents a copy of the Ready, Set, Go! Wildland Action Guide to a visiting resident. Keiki Wildland Firefighter protects hale from wildfire. HWMO drew at least two hundred curious visitors, interested in learning about the latest in wildfire news and preparedness tips. Keiki learned about the fire triangle and various Firewise native plants that they could hold and get to know better. Some even became wildland firefighters for the day, dressing up in real firefighting gear and taking home a Polaroid photo to post on their fridge at home. Firefighters from American Samoa were also present at the festival, showing their versatile skill set by chanting and dancing for visitors.